By creating your own deer pathways, you will encourage reclusive bucks to walk past your stand instead of staying out of sight. Regardless if you hunt in the woodlands of the East, the brush of south Texas or the prairies of the West, locating a funnel adjacent to the perfect ambush spot can be outright impossible. Crooked trees, no trees at all and locations so barren that even an anorexic garter snake couldn’t hide stress even the calmest hunters into fits of fist-pounding hysteria. Instead of falling victim to doctor-prescribed anxiety medication, take a breath, relax and consider this option: Create your own funnels. When natural funnels fall short of expectations, consider creating your own. The off-season provides an excellent opportunity to create such funnels and allows whitetails to acclimate to them well before the hunting season begins. Best of all, you spend as little or as much as you want in the process, and often your greatest expense will be your time. Don’t let the deer pass just out of range this year. Create your own funnel and put yourself in the hunt. Miniature funnels feed off of natural funnels, so you’ll have to scout your hunting area extensively and rely on past experiences to pinpoint prime whitetail routes. Remember that whitetails will follow the path of least resistance and direct routes, as long as they don’t feel vulnerable or pressured along such paths. Create a mini funnel directly to the tree or ambush site of your choice by simply making the original route more difficult to travel or creating an easier route to the final destination. I carry a machete with me often during the summer and fall. I use it to hack trails through brush to allow my horses easier access to backcountry for scouting, but I also hack pathways through thick brush past my ambush sites to lure whitetails into a funnel situation.Thick brush restricts the movement of whitetails, so opening up a path of least resistance invites whitetails to travel a woodland freeway. Not only does a little constructive hacking put whitetails into your view, but the remaining thick brush surrounding the ambush site restricts the view of whitetails, giving you more latitude to move your weapon into position and take the shot. Brush isn’t the only vegetation you can take on with a machete or other cutting device. When I hunt tracts with tall stands of native grass, a little hacking goes a long way into funneling deer movement. Cutting wider trails invites deer past your ambush site. The path-of-least-resistance strategy works even better if you construct a path of more resistance on an original path. Once you have an ambush site chosen and made sure you have a route offering a firearm or archery shot, get to work and block a whitetail’s natural walkway. Take tree limbs, trunks, branches, tumbleweeds, thorny vines and whatever to make a barrier a deer has to circumvent by taking a detour past your stand. Several years ago I had deer circling past my stand in open country, and it would have taken the Great Wall of China to stop them from getting by me. Instead of creating a barrier, I constructed a scarecrow that did the job. I didn’t get a bow shot, but I did make the deer retreat and pass my stand closer than they would have had the scarecrow not been there. If you’ve done your homework, you know where the deer are coming from, where they’re traveling and what their final destination is. Look along that route for fences and gates to help funnel deer into specific locations. Again, deer are basically a lazy lot, and if they can find a low spot in a fence, a downed fence or an open gate, they’ll often travel more than 100 yards to avoid a high jump. If the area is crisscrossed with tight fence, woven wire or higher-than-average fence, you’ll see deer avoiding such barricades like some folks avoid shopping malls on the day after Thanksgiving. This past season ,while hunting with Mike Pavlick at Golden Triangle Outfitters, I warmed to a stand on a wooded hillside above Conservation Reserve Program (CRP) lands and food plots. The deer traveled up a finger ridge past my stand to bed, and they always came to a specific location on the ridge to make their move. While doing some midday scouting, I learned the reason for their specific travel location — a fence ran along the midsection length of the ridge and an open gate invited the deer through the fence and to their bedding cover. Pavlick used the open gate to funnel the deer past my tree stand before the deer entered their daytime bedding hideout. If you can’t find an open gate, ask the landowner if you can leave a gate open along a fence line. If he doesn’t have livestock on the land or trespassing problems, you’ll probably get a green light and a possible hotspot to funnel deer. Since deer study fences to determine the easiest paths to cross, it just makes sense to give them an easy crossing in front of your ambush location. With the permission of the landowner, you can also make a fence easier to cross. By simply removing clips from steel fence posts or staples from wooden fence posts, you can loosen the wire and tie it down to make a crossing even a fawn can get across without scraping its belly. One honeyhole I hunt has a fence in various stages of collapse, and since the landowners don’t bother to keep up the fence any longer, I’ve been able to create several good crossings by tying the wires down to create a low spot for deer to cross. Without question, the deer always come to the low spots to cross during their daily travels. One of my fence crossings has already given up two Pope-and-Young class whitetails, and it’s just a matter of time before another falls sucker to this path of least resistance. If you have the time, budget and inclination, you can carve out funnels that whitetails simply can’t resist. A buck will sometimes sidestep a barrier or jump a fence without using your low spot, but if you create the yellow-brick road, it’s a bet as sure as insider trading that you’ll see action. If you own a tractor and mower or know someone who does, use the equipment to carve paths through a property. A mower or brush hog does the same job as a machete, but on a larger scale. Although mowing and chopping brush is fun, don’t get carried away without scouting and considering the property’s topography. Paths should lead to and from somewhere, ideally from bedding cover to feeding areas and vice versa. It also pays to keep paths parallel or even overlapping existing well-used routes of whitetail travel, but running adjacent to your chosen ambush site. Finally, keep in mind that even though mowed trails are deer magnets, you should keep them in heavy cover. Even lazy bucks won’t walk out on field edges in broad daylight, except for the odd buck in love with a hot doe. Outfitters I’ve hunted with in Illinois, Kansas and South Dakota are now using mowed paths to direct whitetails into shooting range. Recently I was muzzleloader hunting in South Dakota with outfitter Cody Warne at Warne Ranches, who specializes in pheasant hunts but has a weakness for giant whitetails. 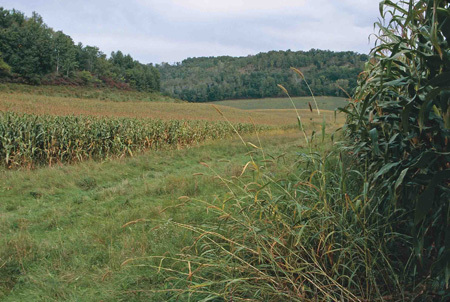 Warne’s property is a treasure chest of food plots, wetlands and native cover. He interconnects them by mowing paths that serve as hunting strips for the pheasant hunters, but also as trails for the whitetails. On the second day of my muzzleloader hunt, a perfect 6x6 buck followed a mowed trail to within 60 yards of my stand and veered off of it to investigate the path of several does just seconds before stepping into a shooting lane. Too bad for him that his course steered directly behind my tree. I tagged him after a shot from 30 yards. If you have bucks that consistently skirt your location and you have the blessings of the landowner, consider building a fence. 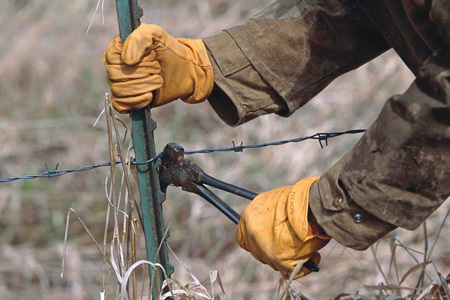 A tightly strung fence with five or more wires that is 5 feet or more in height will drive deer into your lap when placed in the right position. You don’t have to build miles of it either. Less than 100 yards of fence — sometimes as little as 20 yards — can make deer come out into an opening or coulee of your choice that provides better ambush opportunities for stand placement. Food plots, both large and small, can lure whitetails and funnel them past a location of your choice too. Any food plot should be created for the best ambush advantage. Don’t make it too large or too far from trees or cover to restrict good shots with firearms or bows. Some of the best food plots are an acre or less in size and have been strategically located along a major travel route to lure whitetails in for quick hors d’oeuvres before they reach the real buffet. To be effective, the plot should contain “candy feed” such as corn that whitetails can’t refuse, but it should also include foods that provide energy and protein for herd health. 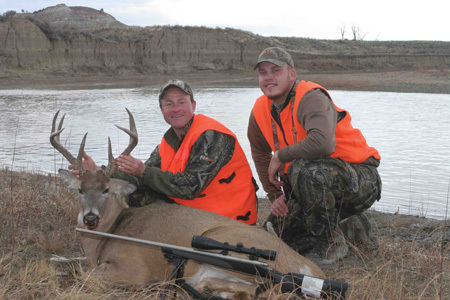 Rich Sundberg and Mark Watkins operate White River Hunts, LLC, a do-it-yourself property. Those guys provide the stand sites, but it’s a self-guided hunt. To benefit the hunters, they have riddled the river-bottom property with mini food plots that encircle a large alfalfa field. As the deer emerge from bedding cover, they help themselves to a quick morsel from the mini plots before converging at the night club for a major meal of alfalfa. Last season while scouting the property for a future hunt, I watched a turnip patch as it drew dozens of deer from thick bedding cover into openings perfect for close-range firearm or archery shots. Why is this effective? Mature bucks that might be shy about showing themselves during legal shooting hours often get fidgety during the pre-rut and roam field edges. The mini plots work as funnels to focus their travels and get them to show themselves in a secluded setting. Plus, you don’t need major farming equipment to plant mini plots. An ATV and small implements can handle most mini-planting chores. It’s relatively inexpensive to purchase mini implements such as a disc harrow, culti-packer, disc/culti-packer combination implement, seeders, sprayers and other accessories. Forcing or luring a buck into a funnel-like trap might be the only way to take a savvy buck that’s experienced several seasons of hunting pressure. Creating your own funnel allows you to control your own hunting destiny.